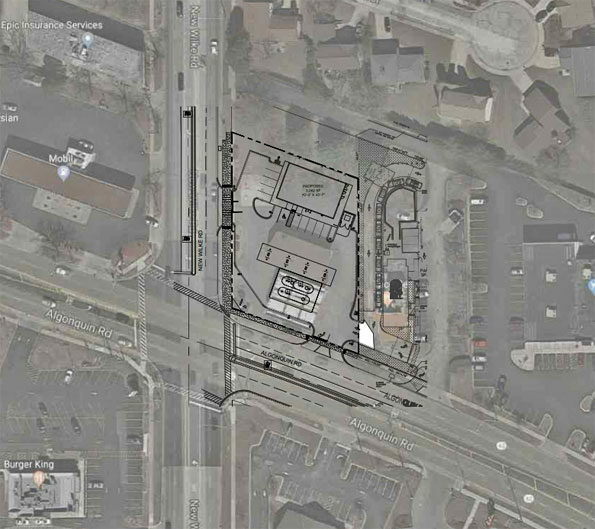 The village board on Monday, March 4, 2019 approved a 24-hour gas station and 7-Eleven convenience store at the northeast corner of Algonquin Road and New Wilke Road. The property will feature eight gas pumps and a 3,000-square-foot store. There will be two access drives, which village officials reported is better than four access drives for the site layout and site accessibility. Intersection improvements at Algonquin and New Wilke, including a right turn lane on westbound Algonquin Road to northbound New Wilke Road that would remove some land from 7-Eleven’s corner. Trustee John Scaletta gave the project a good look, and questioned whether there was enough space available to push snow away for removal, but the engineer’s reply regarding the property was adequate for board approval. The Algonquin-New Wilke intersection project is in planning stages with the Village of Arlington Heights and the City of Rolling Meadows seeking funding. A smaller Citgo gas station was torn down at the northeast corner late 2018. The new 7-Eleven store and gas station will replace the older 7-Eleven store about a block west of New Wilke Road at 1786 Algonquin Road in the Plaza Del Grato Shopping Center. There is one other 7-Eleven store (with no gas station) in Arlington Heights at 1418 Hintz Road at the northeast corner of Buffalo Grove/Windsor Drive and Hintz Road. Gas Station Neighborhood Algonquin Rd and New Wilke Rd Arlington Heights.